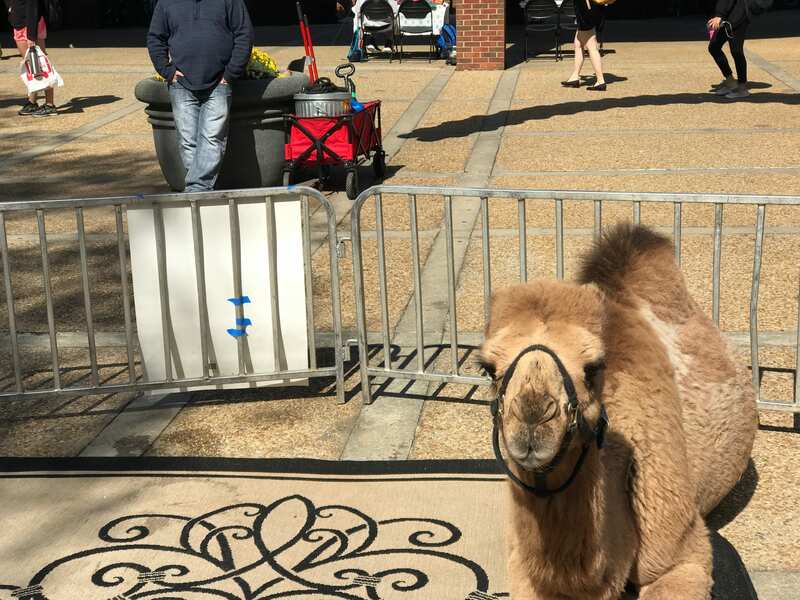 Students at the University of Georgia got a literal taste of Israel today in Tate Plaza. Dawgs for Israel hosted it’s annual Israeli Fest to celebrate the 70th birthday of Israel. Members provided food, decorations and music to share with students passing through. They hoped to change common misconceptions that people have about Israel. While students in Tate Plaza celebrated Israel’s founding day with food and fun, just around the corner, pro-Palestine students protested what they view as 70 years of displacement. Dawgs for Palestine set up a mock apartheid wall and protested as a part of their annual Israel Apartheid Week, a week of events, lectures and commemorations meant to bring awareness to the Palestinian cause around the world. Yoel Ledner, Israeli Defense Force reservist on duty and Israel Fest attendee, disagrees with the Israel Apartheid’s message: “I’ve heard a lot going on this campus for the past few days from certain groups on campus that Israel is an Apartheid state, it’s not. Israel has equal rights for all of it’s citizens,” Ledner said. Despite a counter protest, Nadolne said that Israel Fest was not intended to be political. “We really don’t want to get political, we just want to celebrate Israel’s birthday and show a message of peace and diversity and innovation and teach people things about Israel that they don’t know, so we’re ignoring protests,” she said. With both sides of the historic conflict present on campus, neutral students were able to walk through Tate and for their own opinion. Students for Justice in Palestine continue to host events as a part of Israel Apartheid Week. For a list of upcoming events, visit their Facebook page. For more information on Dawgs for Israel, visit them at their website: www.dawgsforisrael.weebly.com.